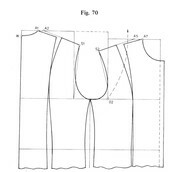 Through appropriate seam placement, a fashionable ‘waisted’ form, without back pleats, can also be derived from this draft. Since the shirt is secured by the trouser waistband, even in sitting, it must be given extra length in the back, at the Rh back height and Tl waist length. This is true, at least partially, even for a woman’s blouse. R = in the lower quarter, from O1 . . . S1, 1 cm extension from the diagonal line. The Length from W is about 80 cm. O4 = middle of O1 . . . O2. At the waist, remove 2 cm from each side, tapering down to the Length. Separate off (cut off) the shoulder yoke pieces, 3 cm down from each of A7, S2 and S1, 4 cm from W.
Position of the shoulder blade pleat (1 cm: Amount from A1 . . . A2): 1/3 from A2 . . . S1. A 4 cm fold is placed at the same point, below the yoke, and this amount is added to the Centre Back (parallel to the length). The yoke (upper left) is made by closing the shoulder blade seams and joining up the separated front and back shoulder parts. Center Back is on the fold, all seams require allowances. h . . . .i = 3.8 cm (with the one piece collar this width may only be a few millimetres more than the collar foot (band) m . . .h). Between o1 und s: In the first third, hollow by 3/4 cm, in the second third curve out by 1 cm. At the middle of s . . . o2: curve out by 1 3/4 cm. p3. . . p4 = ca. 13 cm (7 cm wide single or double cuff). A ... A1 = 2 cm. This amount instead of the back pleat is set as the dart in the waist seam. W. . . A5 = W . . . O2 + 1/20 Ow (d.h. A5 is about 1/20 of the chest circumference in front of a circular arc drawn with its centre at W from O2. 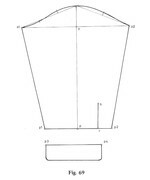 This shoulder position is also employed for other kinds of garments. The amount A7 . . . A5 taken from the waist seam as chest dart. Waist suppression in the front 1 cm in the back 3 cm. For the time being, this concludes the “UNICUT” course. At the most, it could be supplemented by the technical article on “Der Pelzmantel für Damen und Herren” [The Fur Coat for Women and Men] in Nr. 12/1970, never the less, it does not claim to be complete. The author simply wanted to prove by simple examples that all clothing, be it from men’s shirts to ladies fur coats, can be derived in a simple, logical and safe manner from the same basic plan, thus avoiding time wasting during vocational learning. This is especially important, since the boundaries between men’s and women’s fashions are gradually disappearing (and this is not only in the field of sport and leisure wear). For borderline cases in body shape or fashion line the seamless transition from women’s to men’s clothing is missing. With UNICUT this gap is closed. Wow! You translated it. That is really nice.